It’s that day of the week again when we highlight an interior design or architecture must follow on Instagram. 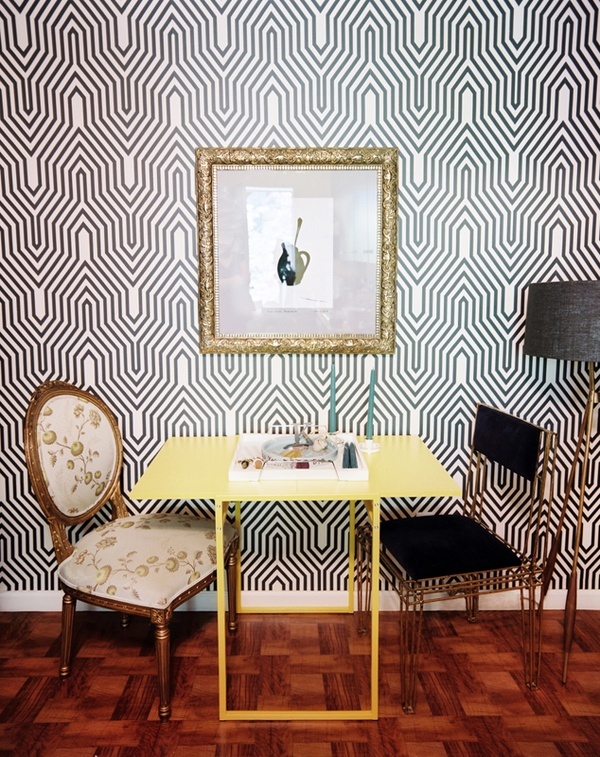 For this week’s #WallGramWednesday, we give you the Instagram account of Ashlina Kaposta aka @TheDecorista. 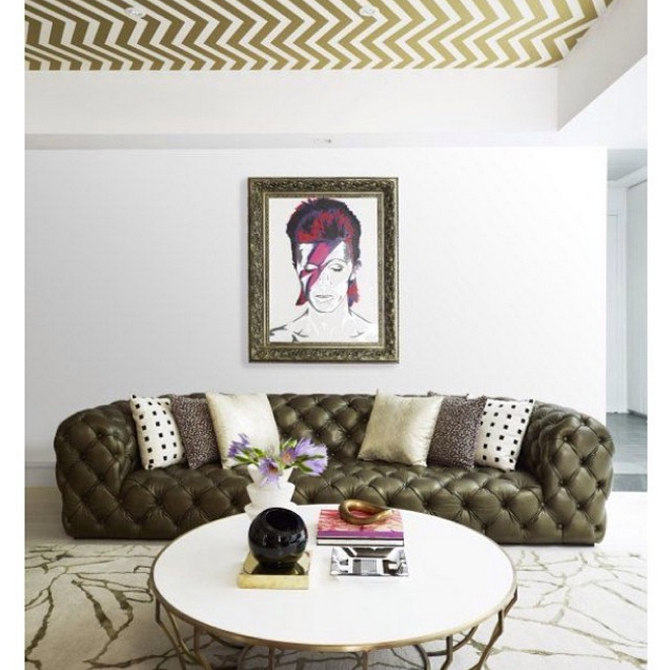 The Decorista’s instagram feed satisfies our most glam interior design cravings with a well curated dose of inspirational interiors mixed with her own design endeavors. You’ll find us on Instagram at @SuperStrataUSA! Happy Wednesday! Today is the day we share a fabulous follow on Instagram who posts inspirational interiors and architecture with fantastic walls. 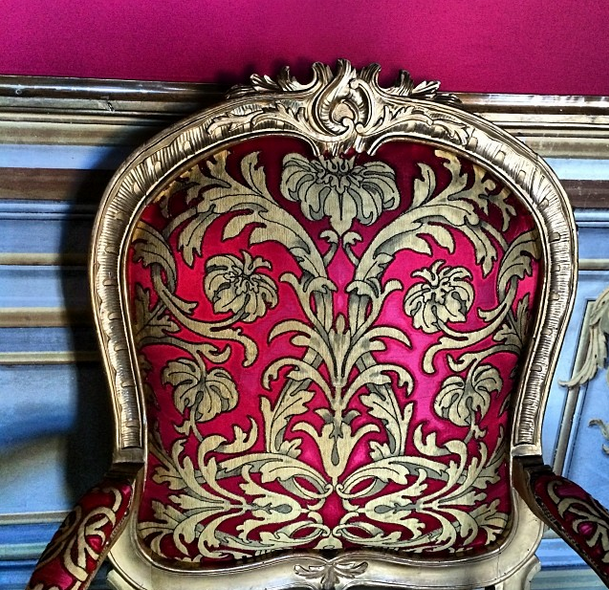 For this week’s #WallGramWednesday post, we’re putting a spotlight on Alessandra Branca‘s always alluring instagrams. You’ll find Alessandra on Instagram as @abranca. You’re bound to be inspired! Photo of the Palazzo Colonna in Rome by Alessandra Branca. 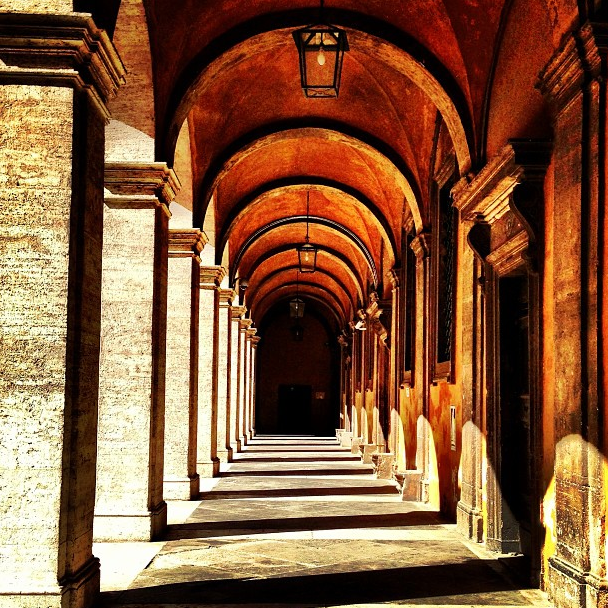 Photo of architecture by Borromini in Rome by Alessandra Branca. TGIF! This is the first of our new series, Friday Focus. Every Friday we will feature a favorite single interior or product that we’ve discovered. This week it happens to be both. We were first introduced to APPARATUS at IFDANY’s Rising Stars of Design. It’s founders, Gabriel Hendifar & Jeremy Anderson, were there to accept the IFDANY honor for APPARATUS. Their presentation was charming, and WOW, did we fall hard for APPARATUS’ refreshing fixtures replete with sumptuous materials (like matte black python!) and expert hand finishing. 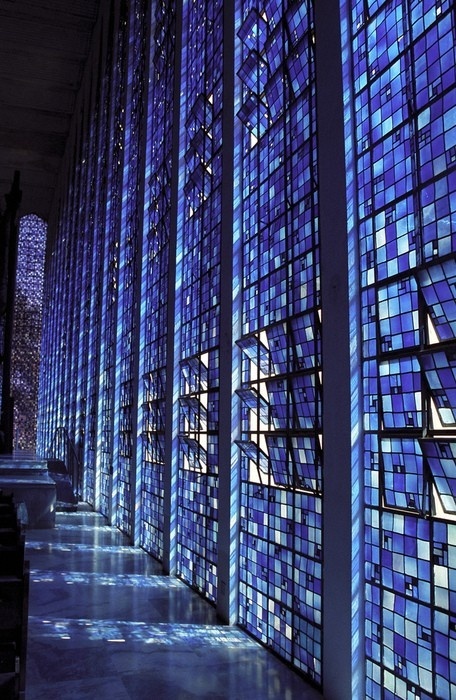 But something else caught our eyes too, and not surprisingly, it has to do with walls. 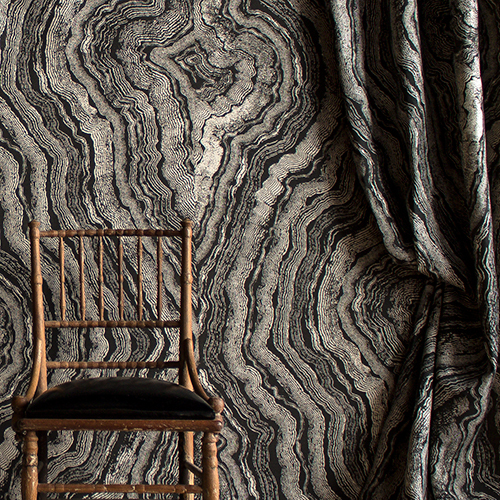 They shared an image of a hand painted wall design based on geological strata in their former Los Angeles home that had the entire audience swooning. That design later inspired Strata Study, an APPARATUS linen wall covering collaboration with ZAK+FOX. 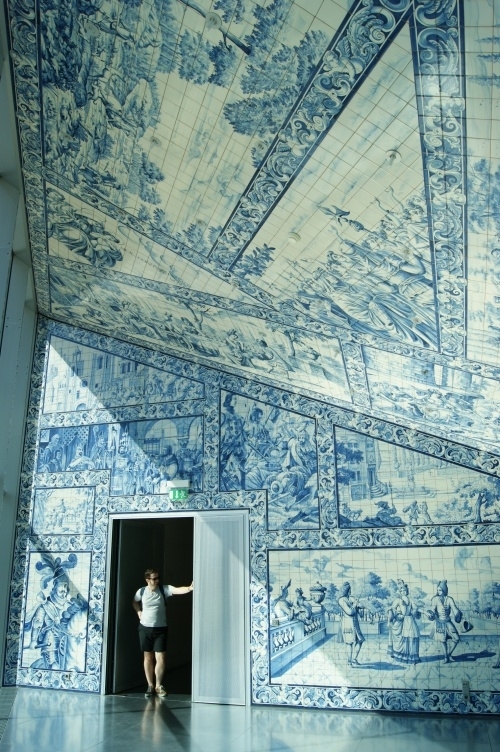 If that weren’t enough, it seems that Gabriel Hendifar has some serious interior design chops. One only needs to see this Hendifar designed dining room to fall even harder. Sigh. Last week we launched #WallPinWednesday to great success! It was thrilling to see all of the fabulous contributions that fellow interior design lovers made to the collaborative inspiration board and to be a part of the conversations that ensued! Thank you to all who contributed everything from tile, lacquer, paint, color, to wallpaper, and of course, inspired interior design. As promised, here is a round-up of some highlights from last week’s Wall Pin Wednesday. There are too many to share all of them here, even though we’d love to! To see the all of the images, CLICK HERE. From Barbara Segal aka @NoirBlancDesign via the Pursuitist a Valencia hotel “fusing historical legacy and modern design” that is beyond exquisite. Fragments of ancient walls, gothic arches, and 19th century palace remains are all integrated into its design. Read the entire post here. It’s worth it, we promise. Our contribution was the master bedroom by the very talented designer Robert Passal in the 2012 Hampton Designer Showhouse via Quintessence blog (please see Q’s post for more on this truly fabulous space.) The luscious wall finish was inspired by the colors of a bouquet and executed by artist Tracy Hines. 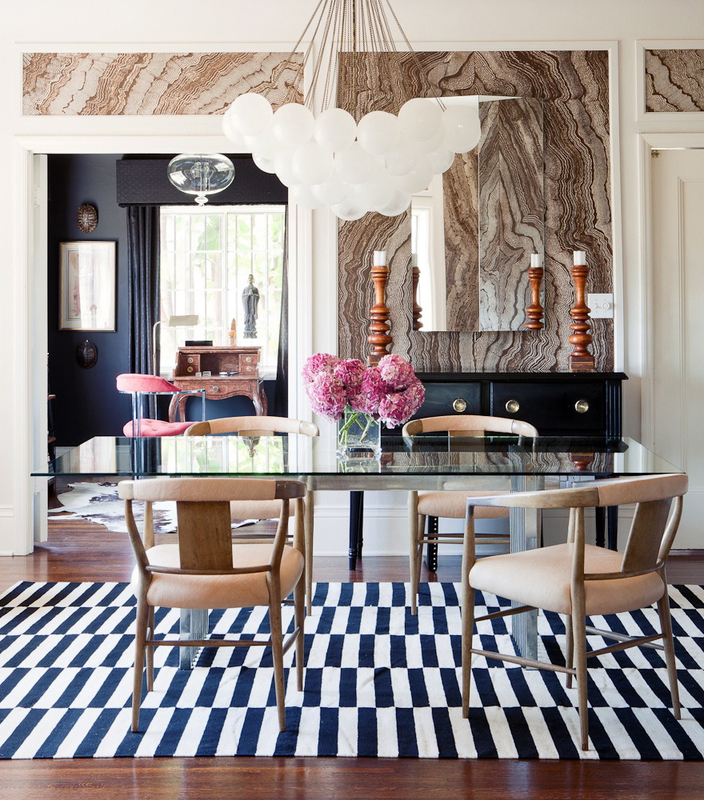 The graphic wallpaper sets the stage in this interior by Kelley Carter in Lonny Magazine May 2012. Photography by Patrick Cline. 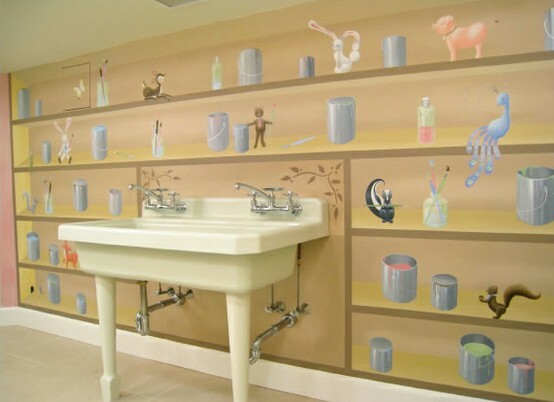 via Customized Walls for #WallPinWednesday. This pink on pink interior may be too much for some, but you can’t deny its power! The wildly glamorous, intensely colorful G Hotel in Galway was designed by Philip Treacy. via Interior Designer Sarah Sarna for Wall Pin Wednesday. We look forward to seeing you all tomorrow for another #WallPinWednedsay! 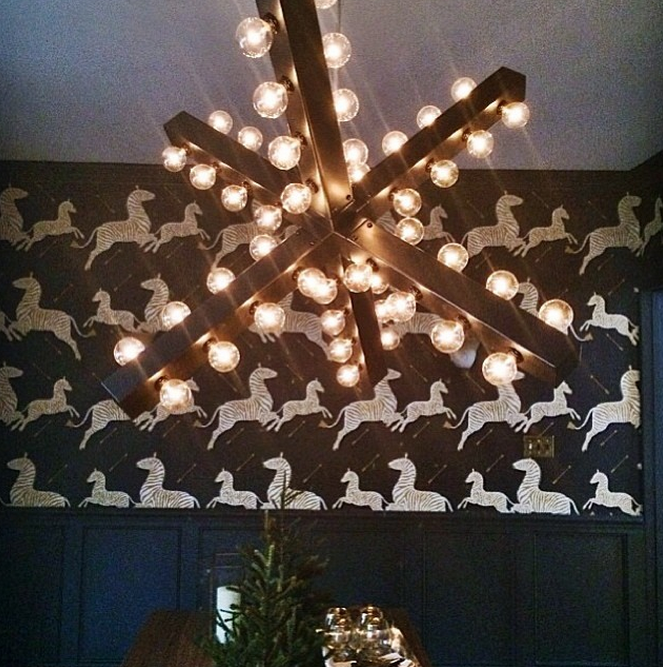 We were recently inspired by one of our favorite chats on Twitter, Interior Designer Chat. Well, truth be told that’s not unusual! But during this particular session the topic was Pinterest, and the discussion, as always, was fast, furious, and fun. Pinterest, if you are unfamiliar, is a fairly new social media site that allows users to collect, “pin”, and share images on “boards”. It basically takes the place of a scrapbook, mood board or inspiration board. The Interior Design community is rightfully quite smitten with Pinterest. It’s a fantastic tool, and especially so for creative and visually based businesses. The conversation, moderated by the founder of the chat, the lovely Barbara Segal of Noir Blanc Design, was steered toward the idea of collaborative Pinterest boards. At this point, Clever Storage, a clever kitchen storage design company, chimed in that they had started something called #DesignPinThurs or in non-tweet parlance Design Pin Thursday. Basically people can pin a design themed image, give it the hashtag #DesignPinThurs, tweet it, and voila, they will re-pin it onto a collaborative inspiration board. We LOVED this idea so much that Wall Pin Wednesday was born and christened with the hashtag #WallPinWednesday. 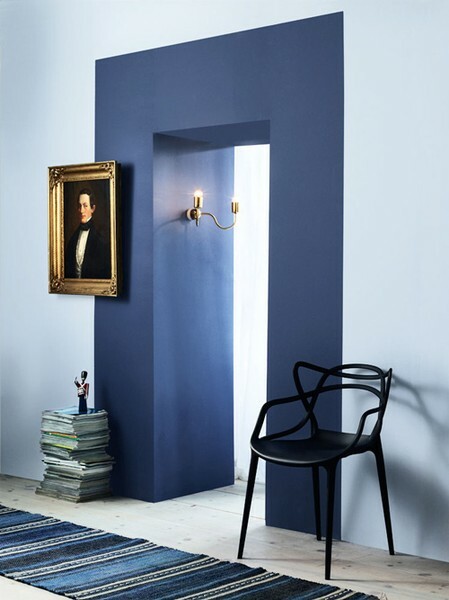 It works like this- tweet an interior design or architectural pin that boasts fabulous walls with the hashtag #WallPinWednesday, and we will re-pin as many as we can to a devoted collaborative board on Pinterest. Whether wallpaper, murals, fabric, mosaics, tile, glass, plaster finishes, distressed walls, paint, wood: as long as it is wonderfully wall related, it is #WallPinWednesday worthy. You can also follow the action on Twitter by searching for the hashtag #WallPinWednesday. We realize that Twitter is not for everyone, and well, frankly, the lingo to the uninitiated can be confusing. But never fear, there will be eye candy in Wall Pin Wednesday for you as well. Simply check out the resulting board every week to see what people are pinning. Or you can check in here for round-up posts of the top Wall Pin Wednesday pins! Here are a few fabulous interiors with noteworthy walls that we’ve found on or shared on Pinterest. Using creative color blocking to define the dimensions of a space. Originally via Desire To Inspire via Skona Hem. 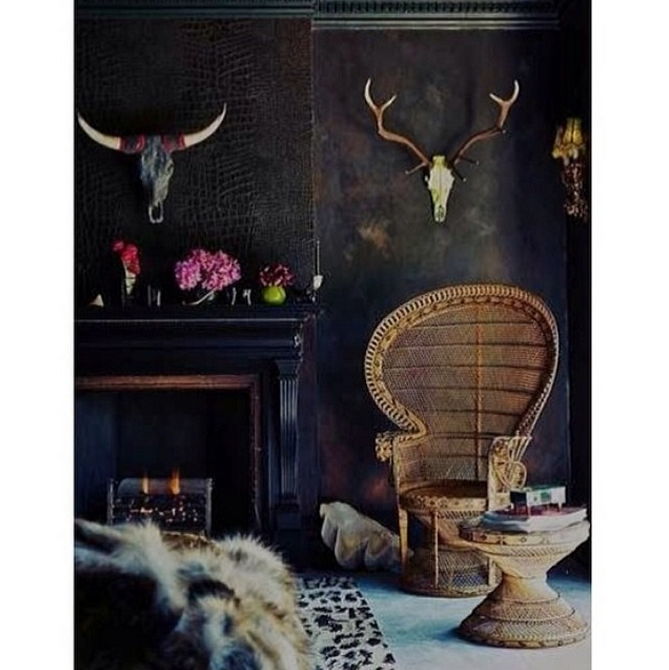 Luxury on the wild side with leopard walls. Pinned via The Decorista. Miles Redd does walls like no other. The dark teal lacquer of this sitting room coupled with pops of orange and turquoise is just one the elements that make it truly spectacular. Re-pinned via ABC Dragoo. 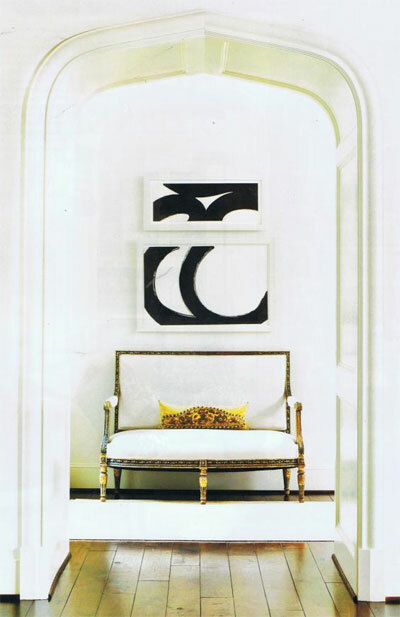 A gorgeously framed hallway vignette is perfection in white. Re-pinned via Elizabeth de Montfort Walker. 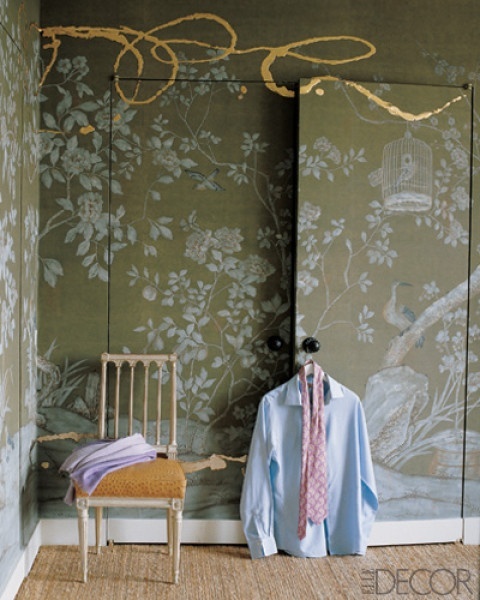 Jeffrey Bilhuber’s Manhattan boudoir luxuriates in custom de Gournay wallpaper with golden gestural strokes by artist Nancy Lorenz. Re-pinned via Webster & Company. 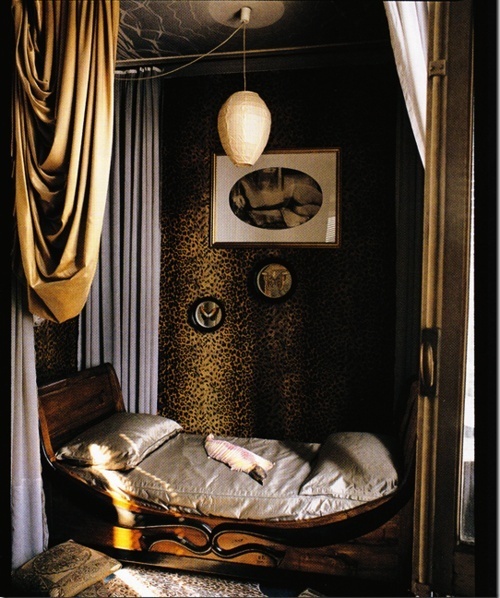 Originally from ELLE Decor, May 2007, Photographer William Waldron. We look forward to seeing your pins for #WallPinWednesday, and remember, we will be posting Round-Ups of the top Wall Pin Wednesday images right here! 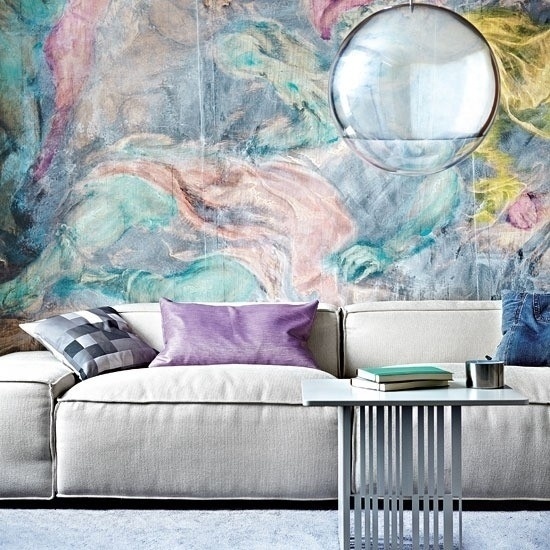 To see the inspiring Pinterest boards of Interior Designer Chat, click here. You can also check us out on Pinterest, where we pin our (and your) inspirations and obsessions. Gentleman, artist, and designer, Sam Simon doing what he does best. 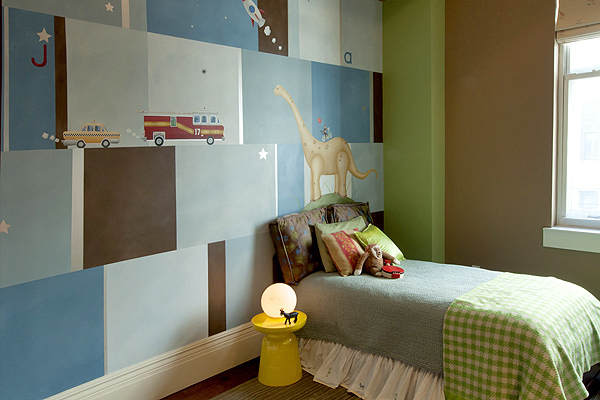 “This is a shared space for two young boys in a very modern home in Manhattan’s Flatiron District. The ceilings are soaring, yet the room’s footprint was not. The challenge was to create a beautiful mural piece that would allow for the furniture placement to change as the children grew older. (Currently, there is a crib on the opposite wall, in time another twin bed will be added under the taxi.) I also wanted the space to feel fun and alive- without being overwhelming or garish. To achieve this I stuck to a relatively tight color palate of blues, browns and touches of red and yellow. Keeping all of the focal points above average headboard height allows the clients to move furniture elements as the boys grow and their needs change. The over sized, washy block pattern looks super smart, and the horizontal lines give a “grounding point” for images like the dinosaur and vehicles. 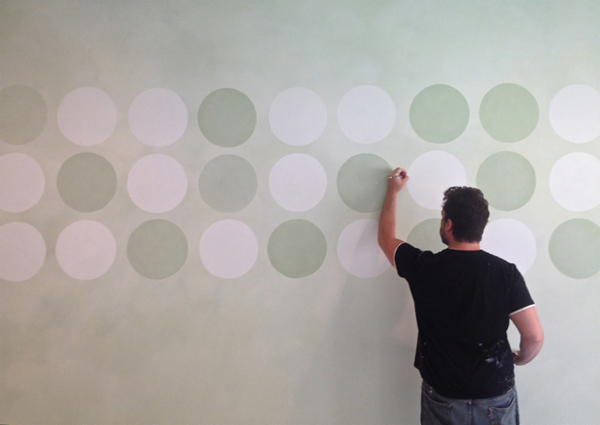 The washy texture that we achieve by mixing several values of the same hue softens the graphic nature of the piece. Metallic white bands and silvery stars glimmer as you move around the room, and your perspective and relationship to ambient light changes. It really looks magical at bedtime! Personalization is what I’m all about- everything from the 17 on the fire engine to the lower case “j” and “a” have significance to the patrons. 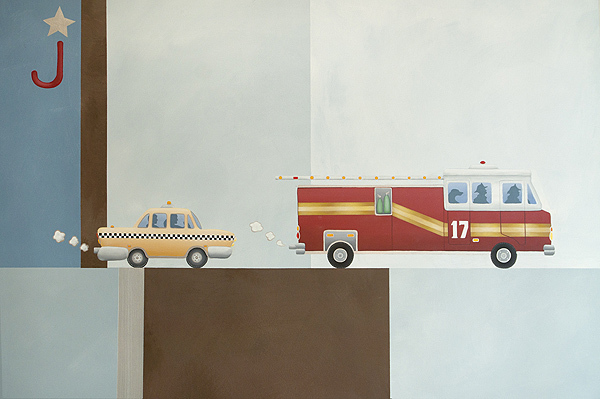 The letters for example signify the first initials of both boys’ names, and the number 17 signifies the local fire station. 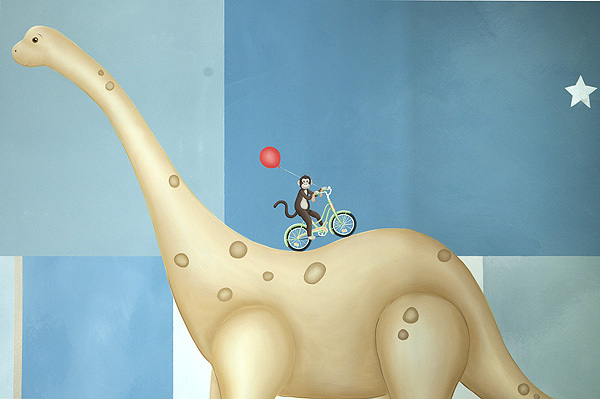 A delightful animal filled mural in a bathroom by Sam Simon. 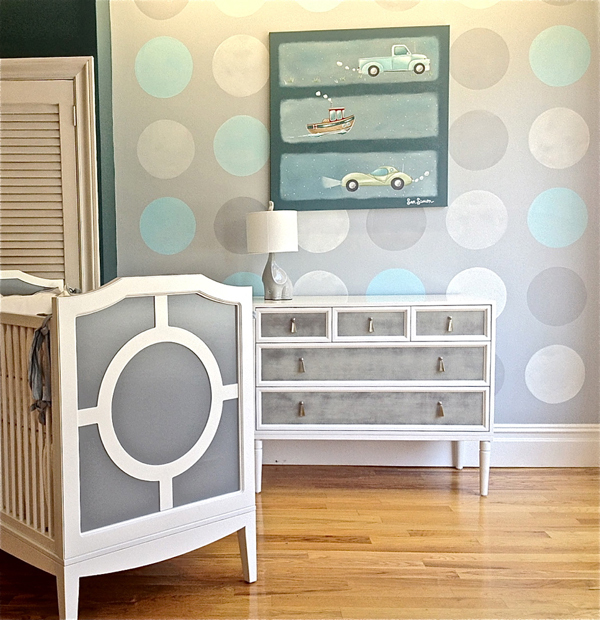 Love the polka dot wall with a custom painting by Sam coupled with nursery furniture by the fabulous New Traditionalists. 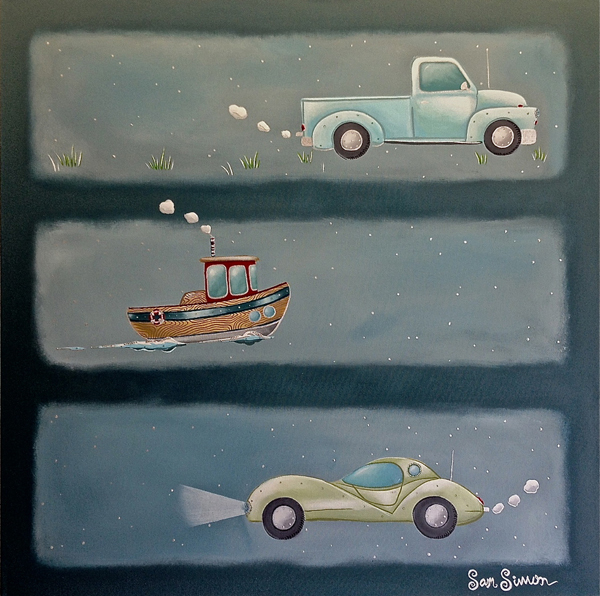 Painting with truck, boat, and car by Sam Simon. 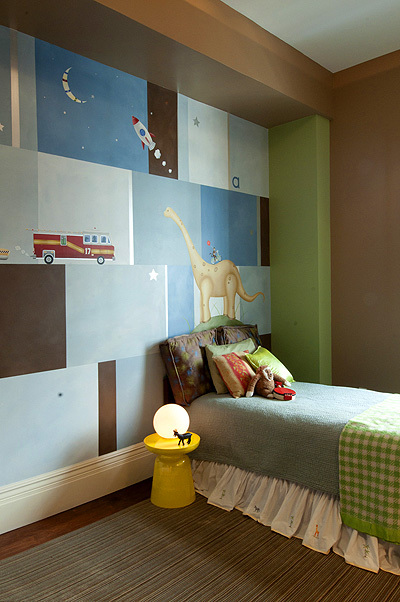 A green nursery sprouts floral tree patterned walls painted and designed by Sam Simon. The last line of Sam’s manifesto is “create your very own beautiful world, piece by piece, personal and precious.” Brushstroke by brushstroke, Sam is helping people do just that. You can find Sam and many more of his magical creations at www.samsimonprojects.com. He can also be found spouting more manifesto worthy quips on Twitter as @1samsimon.